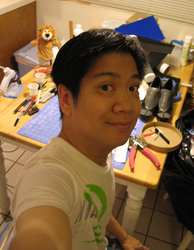 Lionel Lum is a longtime veteran cosplayer and prop-maker who started in the mid 90's and worked his way through many conventions throughout the US providing free props for his cosplay friends. His most famous costumes and props are Bumblebee from Transformers, all of the big bikes from XenoSaga and Final Fantasy series, Raiden from Metal Gear Solid, Origami Cyclone from Tiger and Bunny, and countless props from movies, games and anime like Final Fantasy X-2, Tron Legacy, The Dark Knight, Kantai Collection, Vocaloid, Record of Lodoss Wars, Eden of the East, League of Legends, Macross, and many more. He is also a veteran 17-year convention staffer for many anime conventions and currently provides free convention reports and free cosplay photography on the side for fun. When not attending the conventions around the country, he does cosplay charity work for childrens' pediatrics, goes to a lot of KPop concerts, and spends long hours in engineering labs working on expensive scopes and skyping with fellow engineers in India and Taiwan.